The Funky Felter: Yay! My bubble rings have been featured in Uptown Frum! Yay! My bubble rings have been featured in Uptown Frum! 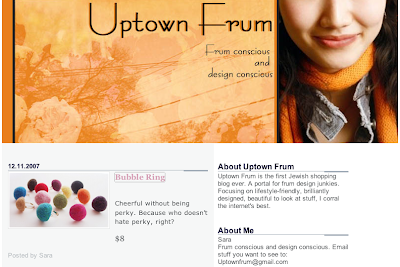 Thanks to Sara at Uptown Frum, a Jewish shopping blog, for featuring my little bubble rings. Here's what she has to say about her blog: "A portal for frum design junkies. Focusing on lifestyle-friendly, brilliantly designed, beautiful to look at stuff, I corral the internet's best." Now go check out Uptown Frum!